Anime Wednesdays: Macross Plus | It's not your tech, it's how you use it. In this month’s Anime Wednesdays, I want to cover a title that’s true to its form, amazingly deep, hits a couple points that are ridiculously true and timely, is incredibly well animated, beautiful to watch, fun for just about everyone, and yet came out over 15 years ago. A series so often overlooked and underrated that a lot of people don’t know it exists, and die-hard fans can’t stop preaching about it. Macross Plus came out in 1994, and exists in two versions – a shortened movie version that ties things up a little too quickly and cuts out some character development I think is important, and an OAV version that was originally released on 4 separate VHS tapes (yeah, I know some of you right now are saying “what are those?”) but is by far the must-see, must-have version of the series. Before we dive into the title and why it’s absolutely incredible and I think you’ll love it (seriously, I do) – take a look at our first Anime Wednesday’s column, where I discuss a more recent title, Paranoia Agent, talk a little about why I miss Satoshi Kon so much, and explain what this monthly series is all about. All caught up? Alright, let’s dive in after the jump. Macross Plus is very much a Macross series – it’s far shorter than just about any other OAV that’s taken place in the Macross universe, but it’s just as compelling and includes all of the same themes you’d expect to find: salvation through music, music as a key to understanding and peace, conflict between bitter rivals, a pretty intense (moreso in this series than many others) love triangle, and of course, giant robots that transform into fighter jets. Hey, I said it had something for everyone, didn’t I? Remember though, Macross Plus came out in the mid 1990s, so the voice dubbing in English is straight awful. I’m not going to pull any punches here, it’s terrible. If you Piumini moncler outlet can at all – see it in the original Japanese, with English subtitles. I’ve seen it on Netflix Instant in English and it’s so bad it makes me want to turn it off and hook up my VCR to my HDTV using cables that simply don’t exist – that’s how awful it is at points. Regardless of the language you see it in (although I’m confident you’ll appreciate this more if you see it in Japanese,) the music is absolutely incredible. It’s mind-blowing, and amazing enough that the first time I saw the OAV and had no idea who was behind the music, I made a point to dig around the Web as much as I could back then and find the Original Soundtrack (OST: Volume 1 | OST: Volume 2 ) so I could have the songs and score from the series to play anytime I wanted. After a friend of mine and I watched the film and investigated a bit more, we learned that the musical figure in the anime, Sharon Apple, became so popular in Japan after the release of Macross Plus that an EP, called Sharon Apple: The Cream P.U.F. was released under her name. Sharon Apple is a pivotal character in the series, an AI powered by another character in the series – we’ll get to that later. I know i’m dancing around it, but if you haven’t picked it up just yet, the reason the music for Macross Plus is so incredible is because the soundtrack and score were done by a composer and musician named Yoko Kanno [ Wikipedia | IMDB | Anime News Network ] – a woman who, I’ve often said, can teach angels how to sing. Macross Plus is still easily available on DVD at Amazon as Macross Plus – The Collection , so if you’re interested, it can be yours without hassle. If you’re familiar with the Macross series and universe, you’ll see some common themes in Macross Plus. The story takes place in the year 2040, about 30 years after the end of the end of the human/zentraedi wars that took place in the original Macross series. The story follows a hotshot young pilot named Isamu Dyson – your typical ace pilot modeled after Maverick from Top Gun – reckless, dangerous, a risk to his comrades, and a crack pilot with unmatched skill. His unit finally gets fed up with him and sends him off to be a test pilot on planet “Eden,” where he has more than a little history, but he’s excited to be transferred to since he’ll have the opportunity to be a test pilot and fly the experimental Shinsei Industries YF-19 variable fighter. Dyson makes his way to Eden only to find that his old childhood rival, half-human/half-zentraedi Guld Bowman – another expert test pilot with a rival aerospace company, is now his rival again and at the helm of the prototype General Galaxies YF-21 variable fighter. Unknown to both of them, an extremely popular virtual idol, an AI Moncler online named Sharon Apple, is headed to Eden to perform at a massive, sold out concert. Behind Sharon Apple is Isamu and Guld’s childhood friend and love interest Myung Fang Lone. The three of them were all best friends as children, and the anime makes heavy use of flashback imagery from their childhood, when they were all happy, spending their days together on Eden. 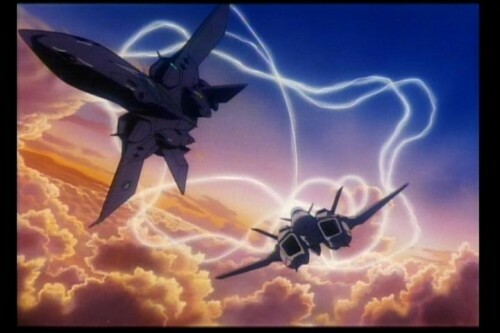 While Isamu and Guld compete fiercely to prove to each other and everyone else in the test program, called “Project SuperNova,” who’s the better pilot, and by proxy, which fighter is the best choice for the UN Space Force (UN Spacy in the Macross universe,) Sharon Apple and Myung are headed to Eden, with Myung and the rest of Sharon Apple’s “handlers” hiding the fact that the AI used to build Sharon Apple is incomplete and imperfect, and still requires Myung, who always dreamt of singing and being a performer in her own right, in order to operate and provide the “soul” for Sharon’s performances. As the story progresses, we get two tracks: the intensifying professional and personal rivalry between Isamu and Guld, especially as Myung re-enters the picture and the two of them compete for her attentions and affections, and the secrets that Sharon Apple and her managers hide. One the one hand we start to see why the childhood best friend trio is now anything but, and where the intense antagonism between once best-friends Isamu and Guld comes from, and how Myung plays into the whole scenario. We learn why all three of them left Eden to pursue their own paths. On the other track, we learn about the relationship between Myung and Sharon, and meet one of Sharon’s technical managers who dreams of perfecting Sharon’s AI, no matter what the cost. We also see Sharon Apple in concert, head the glorious music that Yoko Kanno composed for the OAV, and find out why Sharon Apple is so popular: she induces an almost euphoric state in anyone who sees her and attends her performances. The story climaxes with both the realization of all of the childhood conflicts and passions between Isamu, Guld, and Myung, the truth about Sharon Apple, and the culmination of the SuperNova Project and what it means for Isamu and Guld as pilots and the two prototype fighters and the future of UN Spacy. Macross Plus develops its characters in a way that’s almost unheard of for an anime at the time. it’s easy to define a protagonist and antagonist in simple terms, let the story revolve around them, and then move towards an inevitable conclusion – this series does none of that. Every time you think you have someone pegged as Moncler outlet a hero or anti-hero, you’re proven wrong. Every time you think that a character is doing the right thing, or quietly acting in the best interests of everyone, they do something that’s entirely self-serving. There’s plenty of comic relief, and there’s plenty of reasons to love and to hate all of the main characters. Like I mentioned, many common themes from Macross series run through Macross Plus as well. Sharon Apple’s (and by proxy Myung’s) music moves people incredibly, and both Isamu and Guld find reflection, nostalgia, and salvation through it. There’s plenty of giant robot action during the prototype test flights, and lots of high-speed transforming hijinks. One of the reasons you’ll really love Macross Plus, aside from the incredible character development, is the multi-track storyline. You’ll want to know more about the relationship between Sharon and Myung, you’ll want to know what incident caused Myung and Isamu and Guld’s friendship to fall apart, you’ll want to know whether the pilot’s rivalry between Isamu and Guld is resolved just as much as you’ll want to know if one of them will win Myung’s heart. Myung herself is a strong character – much stronger than a number of female characters in Macross (I’m looking at you Lynn Minmay) and you’ll want to know what she decides, both for her career and her personal life. You’ll also follow the shadowy nature of Project SuperNova, and which fighter makes it out on top. The story is timely in a really unique way that will really resonate with you if you’re a fan of Japanese culture. Sharon Apple is a “virtual idol,” meaning she’s not really a person, but an AI of sorts that sings songs she’s programmed to sing and has an effect on the people who listen to her. She reminds me intensely of Vocaloids, who – while they’re not AIs – are also virtual idols, they just came along 10 years later (approx 2004). Sharon Apple reminds me specifically of Hatsune Miku, another virtual idol with a massive global following and as recently as September held a live concert in San Francisco. The concept of an entirely virtual performer that can draw stadiums full of people who are drawn to hear songs they’ve been programmed to sing is incredible – even if you want to look farther back in time to a band like The Gorillaz (approx 1998, still 4 years after Macross Plus,) which aren’t so much an AI or programmable group but actual characters in a different world who sing songs performed by an actual band that they represent, you can still see the parallels. Whether the events of Macross Plus, in either the movie or the OAV form, are canonical is a topic of serious debate among Macross fans. Personally, I consider them canonical, but I’m nowhere near the intense fan of the franchise as people on either side of the argument more well versed in the universe, its history prior to the events in the series, or the events later in the series are concerned. Macross Plus is so frequently overlooked because the series is only four short OAVs, just over a half-hour each, and they collectively evolve and wrap up very quickly. (Which is what made it so ripe for a 2-hour movie.) The flip side of that though is that you have the benefit of having a Macross series that gets you into the universe without you having to know a great deal of Macross lore and history, although knowing a little will help you a lot, especially towards the end. You get incredible characters that develop on their own without a real need for direct connections to some of the more well-known figures from the series, and you get a stand-alone storyline that excels in almost every area. As I’ve mentioned Macross Plus is remarkably timely, and the animation stands up to the test of time. It definitely feels like a series that was a product of the 90s, and you’ll see some things in the series that definitely date it as a product of its time (corded telephones, answering machines, etc) but they don’t pull you out and break how immersive the story is. The folks behind it know how to build tension and give you a deep storyline that you can watch through in one fell swoop or that you can enjoy OAV by OAV, giving yourself a break in between. If you’re looking for an anime that’s familiar enough to enjoy but unique enough to be interesting and difficult to pull your eyes from, or if you’re looking for a giant robot anime that doesn’t really play out like a giant robot anime (and where the biggest, baddest robot doesn’t necessarily win,) then Macross Plus won’t disappoint.